Slip and Fall may sound lighthearted, but it is anything but. Damaged Walkways – Cracks, Ice, and potholes all fall under this cause. Insufficient Lighting – This includes low lit sidewalks and interior space. Slippery Walkways – Signs warning of wet floors should always be present. “These incidents can occur in any type of privately owned location, Including but not limited to” Homes, Stores, Parks, and Restaurants. 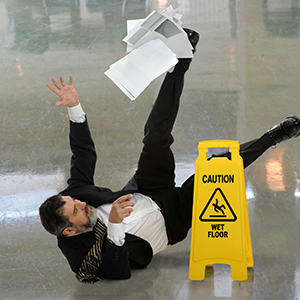 If you or someone you know has been involved in a slip and fall accident, call us right away for proper guidance on the steps to come. We offer FREE consultations, and we don’t charge a fee unless we win your case.